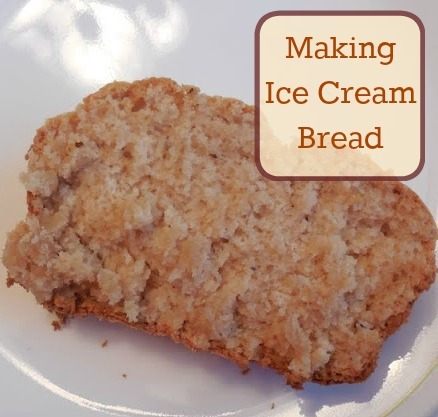 One of my friend's had put a recipe on my Facebook page for ICE CREAM BREAD! I know -- sounds a bit weird yet appealingly yummy doesn't it? Well, I mentioned that to the boys and they wanted to try it out. With only two ingredients needed I was all for trying it out. Ian got out the bowl, measuring cup and spoon as well as the self- rising flour (you can use regular flour too just add 1 1/2 tsp. of baking powder and 1/2 tsp. salt to every cup of four). The one cup measure was dirty from all the earlier baking I did and so we only had a half- cup measure to work with. I told Ian we needed 2 cups of ice cream and 1 1/2 cups self- rising flour and right away he knew we needed to fill the measuring cup 4 times with ice cream and 3 times with flour. The younger two boys picked out the ice cream to use-- we decided on Butter Crunch (and since we didn't have quite enough we added a bit of heath bar crunch). Once everything was measured into the bowl the boys all took turns stirring it together. It does come out pretty thick like real bread dough and needs some muscle behind the stirring but they didn't seem to mind. While they were stirring I greased and floured the loaf pan and preheated the oven to 350. We dumped the mixture from the bowl into the loaf pan and spread it out as best we could then popped it in the oven for 45 minutes and eagerly awaited our results. It looked and smelled so good, we could hardly wait for it to cool off. It was delicious! Moist and a bit sweet the boys decided it mainly tasted like "regular" bread. Before they had even finished their slice of bread they were already talking about the next time and deciding what types of ice cream to try. This could lead to a whole new round of experimenting!